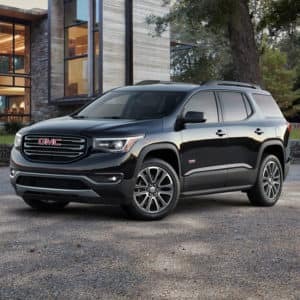 The 2019 GMC Acadia is one to watch in the mid-size crossover SUV class of 2019. Since its introduction 12 years ago, the Acadia has been largely successful, and it will be interesting to see if GMC can continue that success with the 2019 model and beyond. Here we’ll look at some of the features of the new Acadia. The 2019 Acadia comes packed with either a 2.5 liter inline 4 cylinder engine with 193 horsepower that gives you a decent 20-23 combined miles per gallon and can tow up to 4,000 pounds, or a 3.5 liter V6 with about 310 horsepower, the same gas mileage, and around the same towing capacity. It can come with a front wheel or all wheel drivetrain and a 6-speed automatic transmission. There appear to be no changes in terms of these specs compared to the 2018 model. The Acadia has been praised for its looks ever since the facelift in 2017, so it’s no surprise to see GMC stick with the formula that has won them so many plaudits. In one of the few deviations from 2018’s model, the 2019 GMC Acadia has replaced 2018’s H-Rated blackwall tires with non-H-rated all-season tires. In addition, GMC has removed the option for a few external colors, but don’t worry they have added the option for four more, so you have a net increase of one color to choose from. That is basically all for the changes to the exterior, as none of the other exterior features such as headlights or overall shape have been altered. None of the Acadia’s sleek interior design has been tampered with, although GMC has added standard Express Up and Down driver window controls for the SLT-1 and SLT-2 models for the 2019 Acadia. The 2018 model was Express Down only. Also, the accessory level Rear Seat Entertainment system has been removed. The Black edition also comes with five new dark exterior colors to choose from. This new trim gives the Acadia a powerful, intimidating look from the outside, while the introduction of an all-black interior rounds out the dark feel of the package. Be sure to explore the other GMC Acadia configurations before making a final decision! GMC has seen growing success with the Acadia through the years, especially since the upgrade in 2017, and it looks as though they will continue to impress consumers with this new model. To learn more about the new GMC Acadia, don’t hesitate to contact us or call today!